The name ropa vieja means old clothes. The prettiest it may not be, but the tastiest? Oh yes. I have written often about how much I like the Canary Islands. Once Matthew and I started taking breaks together, we set off south to the island of Gran Canaria and promptly fell in love. The sunny skies, friendly people, calm pace of life and delicious food and drink kepts us coming back again and again….we even got engaged on Gran Canaria. Canarian blue skies are always on my list of favourite things. I adore Canarian cuisine. Fresh and tasty and flavoursome. For ages we’ve been saying we’d love to go to explore the other islands too; and I’ve had friends visit Lanzarote, Fuerteventura and Tenerife and they have had the most splendid time. Imagine my delight, then, when an email popped up in my inbox covering two of my favourite topics (food and travel, guilty as charged) and offering the chance to win a trip to Lanzarote with Thomas Cook Airlines. The challenge was simple. A group of bloggers were sent a range of Canarian recipes and asked to select one they would like to recreate at home. These would then be entered into a competition to win a trip to the Canary Islands (apologies in advance for my vote rallying next week). As part of the challenge we were also sent a volcanic rock to use as part of our recipe. More on that later. I selected Ropa Vieja, a stew enjoyed on the Canary Islands as well as in Cuba and South America. Brought back to the Canary Islands by sailors, the stew is often served on Good Friday, but you can find it at other times as well. I loved doing a little background research into the recipe (the one provided didn’t specify amounts of certain ingredients so I went for a google-wander) and found several other options as well, with different herbs, spices and veggies being used in different parts of the world. Poppet looooooooooves food deliveries. 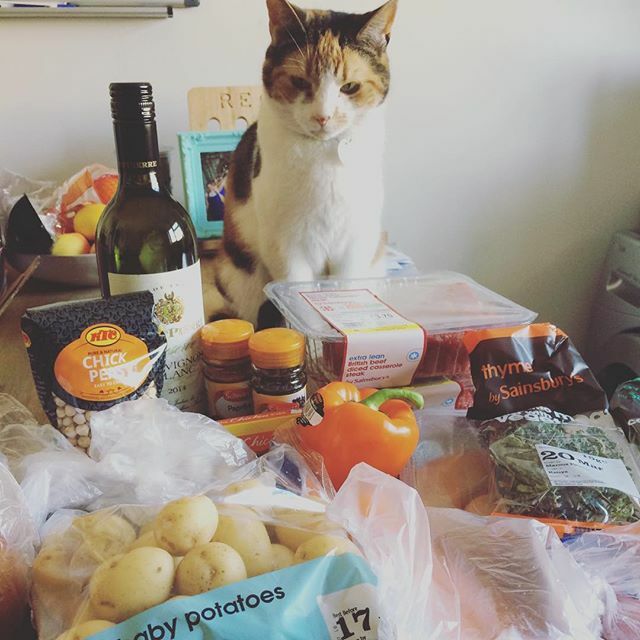 Because she thinks all the food is for her! Chick peas always remind me of Canarian barbecue, and I’m a sucker for a good stew, so I selected that. As you can imagine, as a stew, most of the work involved was stockpot based, but the recipe did call for the shredded meat and chickpeas to be crisped up mid-cooking and that’s when I planned to use my rock. The lava rock is a marvel – you heat it up in the oven and then it retains its heat, making it ideal for searing steak, frying veggies and cooking chicken. It can also be cooled in a fridge and used to serve chilled sushi or charcuterie. Turns out what it’s not great for is frying small spherical foods, like chickpeas, which ping off the sides willy-nilly. Added a delicious phase of mania and messiness to the cooking, I must say! Loved the rock and the serving platter though and can’t wait to break them out for some chicken or fish next week, perhaps with Canarian potatoes and mojo sauce (a house favourite around here). Despite the chickpea based hilarity (who knew legumes had such comedy potential? ), I loved making the stew and ended up with a rich, delicious dinner. I served it with a peppry rocket salad with red pepper slivers and cherry tomato halves, drizzled in a honey-balsalmic dressing, as well as fresh bread for mopping up the sauce. With a chilled glass of Sauvignon Blanc alongside it was a tasty, filling supper. When the husband’s away….more wine for me! Fresh, tasty, and really filling! Disclaimer: I was gifted the lava rock and the ingredients needed to make this dish by Thomas Cook. All cooking anecdotes, opinions, and Canarian remembrances are my own. Previous Post C2C 2016: What a Weekend! It's definitely one of the ingredients which always makes me think of that lovely place!